CarGurus has 1,052 nationwide Prius v listings starting at $5,695. Certain brands become such a standard-bearer for their genre or market that their name comes to represent that segment as a whole (like a synecdoche). This could be said of Kleenex (tissues), or the iPhone (smartphones), and the same thing seems to have happened with the Toyota Prius and its fellow hybrids. The branding for the Prius has grown so strong that Toyota is evolving the hybrid into something of a franchise all its own, including the company Prius c and the car you see here: the 2016 Toyota Prius v.
The Prius v is closely related to the standard Prius, which has been redesigned for 2016. Although this means that the Prius v is based on an outgoing Prius model, the polarizing look of the new non-v Prius may have buyers flocking to the older design. Prius v buyers should feel grateful that the model retains its sharp lines and more widely accepted styling cues, including a minimalist front grille, angular headlights, and the recognizable character line that runs the length of the car just below the windows. Where the v differs from the older Prius is in its higher rear end, showcasing a larger interior volume. The Prius v's interior features a few unique touches over the regular Prius. For instance, the flowing center stack and console has been broken up to allow for more useful access to storage. There are compartments and storage pockets pretty much everywhere in this car, actually, including a rear-seat cargo tray. The Prius v has 34.3 cubic feet of storage space behind the rear seats, but fold down the split-fold rear bench and you get an impressive 67.3 cubic feet of cargo space. True to their frugality-first image, Prius trims are modestly named: Two, Three, Four, and Five. But despite this minimalist branding, the Prius can be outfitted with a wealth of features and options. The Two trim comes standard with features such as Entune infotainment technology interfaced with a center touchscreen, a Smart Key system with push-button start, automatic climate control, and a standard backup camera. Opt for the Three trim and you get features like an onboard navigation system, a 4.2-inch TFT multi-information display, halogen projector headlights, and a 6-way adjustable driver’s seat with lumbar support. Upgrade to the Four trim and you get an 8-way power-adjustable driver’s seat, heated front seats, SofTex leatherette upholstery, and an auto-dimming rear-view mirror. The range-topping Five trim adds 17-inch 10-spoke alloy wheels, integrated fog lights, and LED projector headlights. There is also a host of available features liked added infotainment options and advanced safety technology. The Prius v features the same powertrain and drivetrain as the conventional Prius, albeit with a few unique tricks. The hybrid blueprint begins with a 1.8-liter Atkinson-cycle inline-4-cylinder gas engine mated to a 60 kWh electric traction motor that receives power from a nickel-metal hydride battery. The combination results in a net system output of 134 hp, good enough to help it get from 0 to 60 in the neighborhood of ten seconds and to offer fuel economy of 44 mpg city/40 highway/42 combined. Unlike the regular Prius, the Prius v features an integrated “Pitch and Bounce” feature. Because the Prius v is a larger vehicle, capable of carrying larger cargo items, Toyota designed this system to work in tandem with the suspension in order to even out longitudinal oscillation and other forces that might apply to the car when traveling on a bumpy road under a full load. Toyota also thought about what it would be like to start the car in all manner of weather, resulting in a revised engine cooling system for the Prius v. These systems are almost always tied to the climate control system, as heat from the engine is changed into heat for the cabin of the car--but Toyota reworked this system to reduce engine warm-up times and deliver warm air to the cabin more quickly. 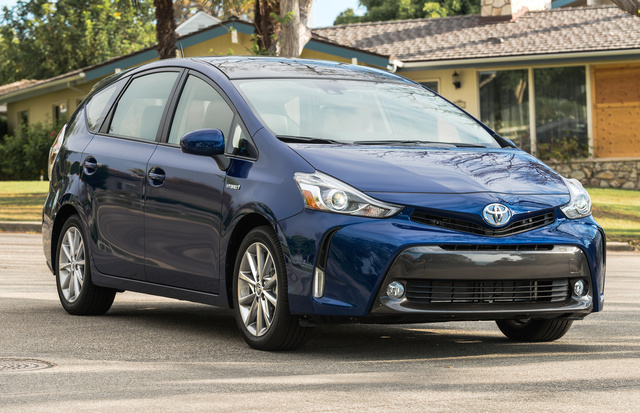 Base MSRP for the 2016 Toyota Prius v is $26,675 for the Two. The Three starts at $28,060, while the Four comes in at $29,695 and the range-topping Five starts at $30,935. You can also get options such as the Advanced Package, which includes a JBL premium stereo, Dynamic Radar Cruise Control, Pre-Collision System, Lane Departure Alert, Auto High Beams, and a Panoramic view sunroof. A well-equipped Five trim will cost around $35,000. The Toyota Prius is perhaps the ideal embodiment of environmentally friendly commuting that won't break the bank. The Prius v improves upon a good thing, with an interior that combines the Prius philosophy with all the versatility that will make getting to and from the hardware store just as easy as getting to and from the office. What's your take on the 2016 Toyota Prius v? Have you driven a 2016 Toyota Prius v?